Depending on what side of the aisle you’re on, government regulations can be seen as necessary measures to roll back abuses in certain industries or job killer that stifles businesses and slows the economy. President Trump believes the latter and has promised to roll back key Obama-era regulations. He has pledged to cut back 75 percent of regulations in an effort to create jobs in industries that have declined in recent years. There has already been swift action by Trump and members of Congress. Rollbacks on regulations have impacted education, the coal industry, guns, and even small businesses. There’s already a bill, The Regulatory Accountability Act, that’s being pushed through that would place accountability for federal agencies and create rules for regulators to disclose how regulations affect the economy. The bill is strongly opposed by economic institutions like the Economic Policy Institute, who says that workers would be negatively affected. Here are some pros and cons of deregulation under Trump. In April Donald Trump signed an executive order telling the Agriculture Department to eliminate regulations that are deemed as unnecessary. Trump was backed by those in the industry and touted this as a way to promote economic growth in the agriculture industry. Many feel that removal of some regulations will help their businesses, while some have expressed mild worry. George Hoffman and his wife are farmers that run a small dairy farm in Wassaic, a small town about two hours outside of New York City. Hoffman, who regularly does business with many meat markets in the city, is an avid Trump supporter. He believes that Obama-era regulations has hurt the farming industry. Hoffman is a big proponent of U.S. removing itself from the North American Free Trade Agreement under Trump. As a dairy farmer, he feels that it benefits countries like Canada and hurts farmers in the U.S. Some economists, however, believe the issue is more complicated because the impact on farmers depends on the specific farm, the type of regulations and whether the regulations are coming from the federal government or state governments. Another form of regulations that Trump had promised to target when he became president were those aimed at the financial and banking sector. He said that many financial regulations encourage “risky behavior.” He has particularly taken aim at the Dodd-Frank Act, a law signed by President Obama in 2010 that placed heavy regulatory burdens on financial institutions. The law was signed in response to the 2008 financial crisis. Trump has criticized the law for its stringent financial policies and stated that many of his friends were unable to get business loans because of it and wants to repeal or severely weaken the law. 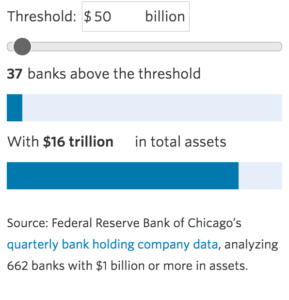 Community Banks favor relaxed regulations in the industry and have shown support to bipartisan bills like the Main Street Regulations Fairness Act, which would increase the limit on banking assets subjected to Dodd-Frank stress tests to $50 billion. Community banking associations like, The Independent Community Bankers of America, have come out in support of reduced regulations. “Community banks did not cause the financial crisis of 2008 and 2009, and stress testing them does nothing to make the financial system safer,” they said in a press release. However, there is concern for those in the financial industry if Dodd-Frank is repealed or weakened. Steven Lora, a risk analyst for National Futures Association, a self-regulatory organization for U.S derivatives, doesn’t believe that there’ll be a full repeal of Dodd-Frank, but suggests that if it were repealed or weakened it may threaten jobs at NFA because of their direct dealing working with member firms and making sure they comply with the law. 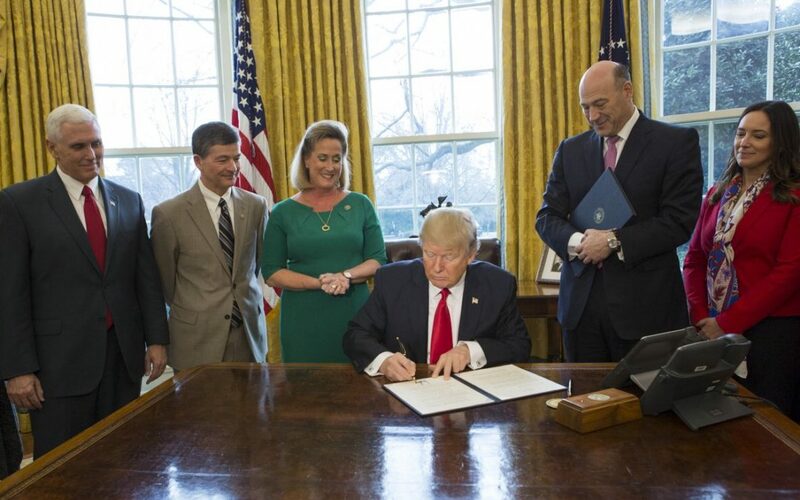 As part of his push to deregulate parts of the financial sector, Trump has promised to close the fiduciary rule, which put pressure on advisers of retirement accounts to serve their clients’ best interest. Reversal of the rule was met with strong resistance by the Economic Policy Institute, who believe that the removal of these rules would cost clients billions of dollars. Donald Trump’s stance on energy regulations has had many in energy related industries singing his praises. Since taking office, Trump has put in place executive orders reversing Obama-era energy rules that he claims have been harmful to the economy and has cost jobs; particularly jobs in the coal industry. He has pushed a plan called “An America First Energy Plan” which would eliminate regulations and promote energy dependence. “I am taking historic steps to lift restrictions on American energy, to reverse government intrusion and to cancel job-killing regulations,” Trump said in March. However, experts believe that the president’s efforts to bring back coal jobs is futile. The coal industry shrank 40 percent since 2011, while dependence on solar energy has increased by 5000 percent in a 10-year period, according to the Department of Energy. Coal, which is used to generate electricity, has experienced a decline in recent years. In April, the U.S. Energy and Information Administration released their energy consumption report. It showed that coal use declined by 9 percent in 2016, despite more Americans consuming more energy. Those in the coal industry, who overwhelmingly supported Trump during the presidential campaign, believe that regulations under Obama hurt the industry by not allowing it to be competitive with natural gas.